Anchor Bay has announced the Blu-Ray release of Andrew Dominik’s Killing Them Softly for March. The film stars Brad Pitt, Richard Jenkins, Ray Liotta and James Gandolfini. Director Andrew Dominik’s political gangster drama Killing Them Softly just might be one of the best shot movies I’ve seen in a long time, possibly even since his last film, The Assassination of Jesse James by the Coward Robert Ford. It’s a major bummer knowing that the film didn’t find an audience during its brief theatrical run, mostly because of trailers that were selling us on the next crime thriller, when the result was a slow-burn drama that took a look at our financial collapse from just a few short years ago. Critics were equally split, with most recognizing Dominik’s ability to direct and Pitt’s brilliant performance. The deciding factor was the political undertone that laid itself on pretty damn heavy. I thought it was fitting and made for a straight-forward approach, while others thought it was a bit too preachy and on-the-nose. I’m just excited to relive the film on Blu-Ray, because so many scenes are going to look beyond beautiful in 1080p high definition, especially the slow-motion shootout. And let’s not forget about the film’s opening credits and just how immersive that’s going to sound with a lossless track. 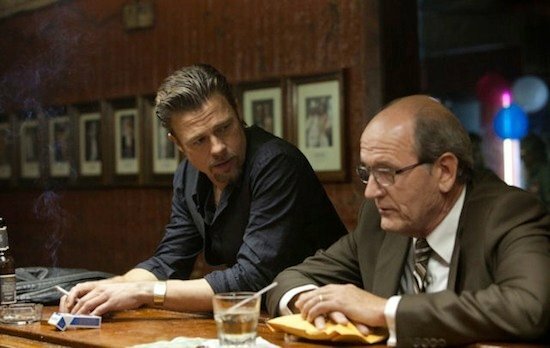 Killing Them Softly is well made, written, and acted, but the allegorical story and repulsive characters are too one-note and unpleasant to enjoy or recommend. Killing Them Softly streets on March 26th, 2013.